Chia seeds are readily available now in health food shops and online. They’re definitely cheaper to buy online in bulk from a lesser known brand. I usually stock up on a 500gram bag and they last me at least two months – but be warned, they are little devils to wash up and get stuck to just about everything in your kitchen! But I’ll forgive them as they’re one of the wonder foods I couldn’t go without. Not only are they packed with fibre, protein and omega 3 fatty acids which keep you feeling full, they’re also low calorie and absorb tons of water, helping you stay hydrated too. Plus they make delicious desserts like this! I’m trying to cut down on the amount of chocolate I eat (cause nobody wants cacao dependency), and this light, creamy pudding is the perfect accompaniment to a hot summers’ evening, allowing you to truly cool down. My recipe is um… intuitive shall we say, but I find that you need about three times as much almond milk as you do chia. It’s surprising how much they absorb, and once you start experimenting you’ll see for yourself that the liquid really does all go somewhere! 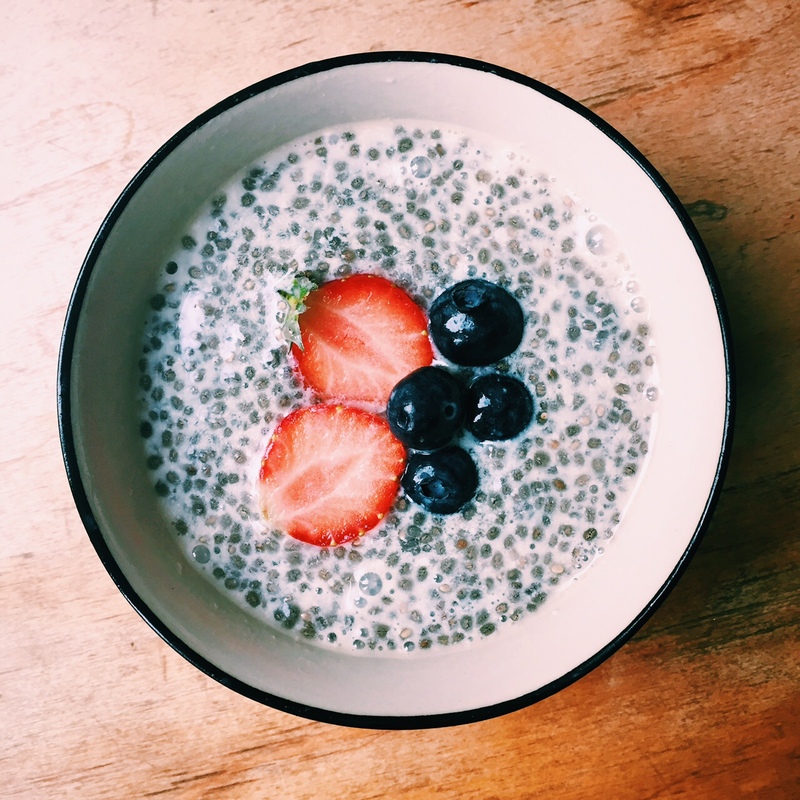 Spoon the chia seeds into a small bowl or jar and cover with almond milk. Stir well and add the vanilla extract and coconut sugar. Seal the jar with a lid or wrap cling film over the bowl and refrigerate for at least 20 minutes. I usually leave it around 30-45 minutes which gives enough time to let my dinner go down (and catch up with whatever Netflix series I’m currently on!) Then once you take it out of the fridge, you’ll find that the chia seeds have swollen up and become a jelly-like consistency. Stir it a bit more to get rid of any lumps. Top with a few berries, nuts or whatever you fancy, and enjoy!